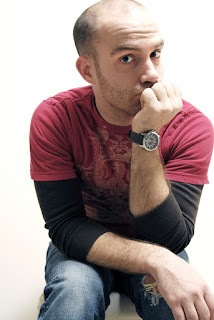 Leesburg native Justin Trawick, featured previously on MMS for his work with the Pink Jams! breast cancer non-profit, has released a new album, You & I. Combining the strengths of his deeply personal take on songwriting with the frenetic energy of his live shows, the new album was recorded live in the studio, "Peel Session" style, by producer Jim Ebert at Falls Church's Cue Studios. Ebert employs the "Decca Tree", a spaced three-microphone array first utilized by the British branch of Decca Records in the 1950s, that imparts a wide stereo image on the recording and captures the breadth of Trawick's sound. Trawick employs a more intimate and stripped-down sound on the new album, playing the acoustic guitar with Josh Himmelsbach backing him up on mandolin, piano and vocals while area rapper Flex Matthews adds freestyle raps to a pair of songs. At 29 Justin is growing into and embracing his idiosyncratic voice, his cadence and delivery mining the territory between G. Love's urban folk and Eef Barzelay's lo-fi folk. You & I imparts new life into old favorites "That Old Forgotten Street" and "To New Hampshire", the minimalist sound emphasizing the plaintive yet cautious optimism of the former and the heartbroken romanticism of the latter. "Someone" is a devastating elegy to the choices not made and chances not taken, a lyrical successor to Colin Hay's "Waiting for my Real Life to Begin" written from the perspective of an 82 year-old Trawick. Standout new tracks include "Back of my Mind", supercharged by Flex Matthews' freestyling, and "The Circus Life", a slow-rolling but catchy coming-of-age tale. The album's titular "you" is conspicuously absent, the ghosts of lovers who left or were left behind, and Trawick charts that course through early adulthood and young love, in the existential angst of someone who feels his youth slipping away, and speculatively through the eyes of an octogenarian realizing he has squandered his opportunities. Despite this, You & I is not a sad album, but rather an unguarded window into the life of someone who would rather love and lose, a person who would chart a course and then realize he has to change directions. Trawick has not lost any of his trademark vocal swagger; he has simply grown a little older, a little wiser, and his listening audience is the richer for it. Although the album has been out for a few weeks, Trawick is officially launching You & I this Friday at Artisphere, with special guests Andy Zipf and Amanda Lee supporting him. Doors are at 7:30pm, and tickets are $12. As good as his albums are (and they are!) don't pass up the chance to see him perform live.